The rate at which local authorities are issuing Penalty Notices is accelerating. Here is the data showing how many have been issued over the last 9 years. More Penalty Notices were issued in the year 2017/18 than were issued in the first 5 YEARS of this regime! It is on course to hit 350,000 this year (218/19). If all local authorities issued them at the same rate as the Isle of Wight (137 per 1000 pupils) then ONE MILLION would have been issued this year! How likely are you to end up being prosecuted depends largely where you live. If you live in the North West of England you are SIX TIMES more likely to be prosecuted for your child’s absence from school than in London! The figures are even more shocking when compared by local authority. 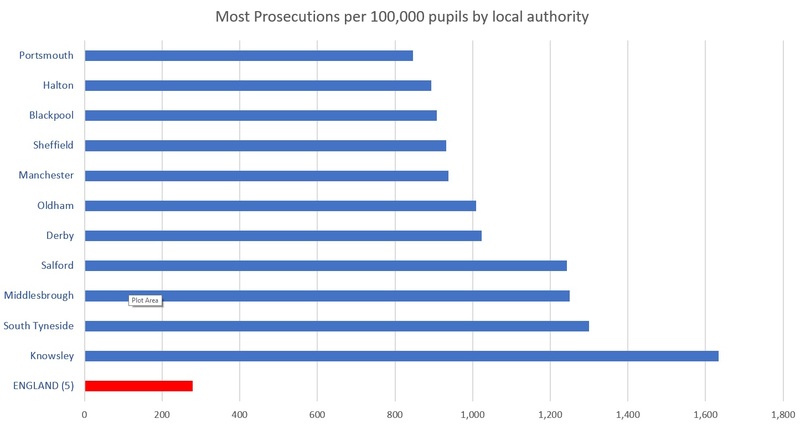 If you live in Knowsley then you are 20 TIMES more likely to end up in a Magistrates Court if your child has a day off school without the school’s permission, than those who live in London! 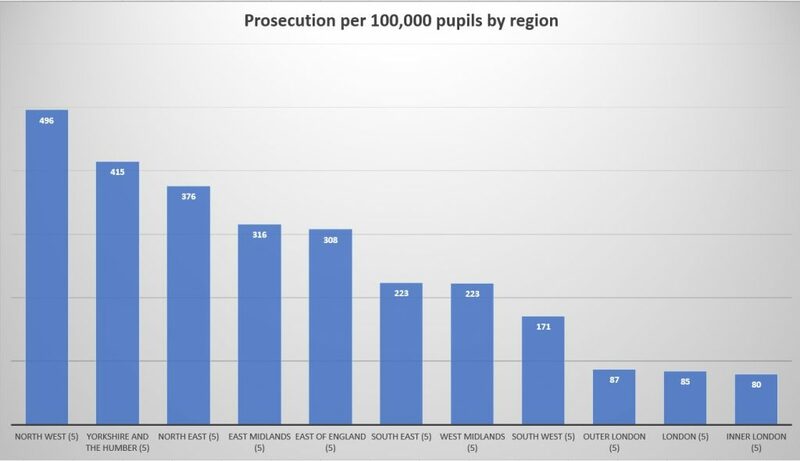 The following graph shows the number issued by each local authority as a % of the number of pupils in their schools. The disparity is remarkable. At one end you have the Isle of Wight who issued 137 per 1000 pupils (almost one in seven parents in a single year). The national average is 37! Five local authorities did not issue a single Penalty Notice. Want to know how likely you are to get prosecuted if you refuse to pay a Penalty Notice? Last year 19,518 parents were summoned to court following non-payment of a Penalty Notice. 260,877 were issued and of that 27,296 were withdrawn for various reasons. In 11,571 cases the Penalty Notice was NOT paid and no prosecution was brought against the parent(s). Some local authorities take no further action in a high proportion of cases if you don’t pay a Penalty Notice. Kingston upon Thames for example took no further action in 60% of cases where a parent refused to pay it. 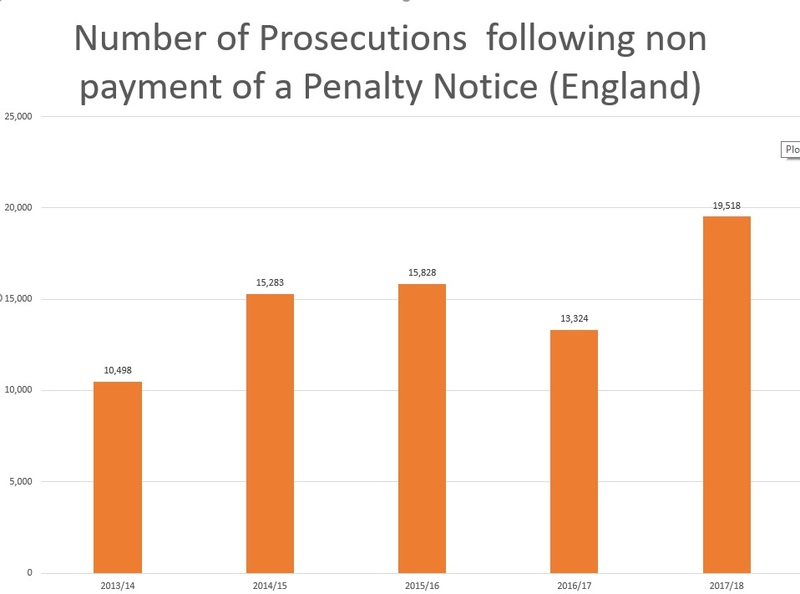 In a small number of other areas the rate of cases dropped is over 33% but on average, only 4.4% of cases are dropped when a penalty notice has not been paid within 28 days!